Can People With Celiac Disease Donate Blood? 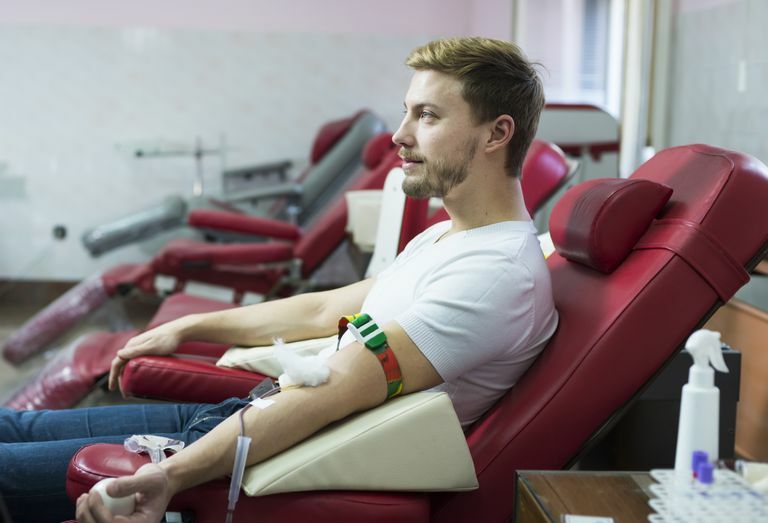 Yes, someone who has celiac disease can still be a blood donor, assuming that person passes the other screenings required by the U.S. Food and Drug Administration and individual donation centers. If you visit a center or attend a blood drive to donate blood, you'll first be asked several questions about your health and your lifestyle. According to Debbie Bright, RN, medical assessment coordinator for the southern region office of the American Red Cross: "We don't ask about every detail of a prospective donor's health history. Although the questioning seems extensive, we are interested only in protecting donors' health and safety while providing high-quality blood products to patients. Beyond the first question, 'Are you feeling healthy and well today?' I cannot think of any question that would elicit a history of celiac disease, and there is no reason to expect a donor to volunteer this history, except maybe to evaluate the advisability of partaking of snacks at the canteen table afterward." To give blood for transfusion to another person, you must be healthy, be at least 17 years old or 16 years old if allowed by state law. You must weigh at least 110 pounds, and not have donated whole blood in the last 8 weeks (56 days) or double red cells in the last 16 weeks (112 days). "Healthy" means that you feel well and can perform normal activities. If you have a chronic condition such as diabetes or high blood pressure, "healthy" also means that you are being treated and the condition is under control. Bright points out, "The last sentence in the paragraph could easily read, 'If you have a chronic condition such as celiac disease, 'healthy' also means that you are being treated and the condition is under control." In addition to passing the health questionnaire part of the donor screening process, plus a blood pressure, temperature and pulse check, you'll also be tested to determine whether you have enough hemoglobin in your blood. That's where some people with celiac disease might have a problem. Celiac can predispose you to iron-deficiency anemia, and one of the symptoms is low hemoglobin. Hemoglobin, a protein found in your red blood cells, carries oxygen throughout your body. You need iron to make hemoglobin. However, some people with celiac disease don't absorb enough iron because their small intestines are damaged. Therefore, they can't make enough hemoglobin, and their low hemoglobin shows up in the hemoglobin test conducted before a blood donation center will let you donate. According to the Red Cross, normal hemoglobin levels are usually 13.8 to 17.2 grams per deciliter (g/dL) for men and 12.1 to 15.1 g/dL for women. You must have a hemoglobin level of at least 12.5 g/dL to donate blood (yes, this disqualifies some women in the "normal" range). It's not clear how many people with celiac disease are disqualified due to low hemoglobin. However, if your pre-donation screening test shows your hemoglobin is too low for you to donate blood, you should talk to your doctor about the possible reasons for this result. American Red Cross. Donors Deferred for Low Hemoglobin fact sheet. American Red Cross. Iron Information for All Donors fact sheet.